Sergio Cairo picked up four hits for the Rio Grande Valley WhiteWings in this June 1998 win, according to The Brownsville Herald. WhiteWings manager Eddie Dennis praised the team, but also Cairo, to The Herald after the game. "We've been hitting the ball consistently the last three games," Dennis told The Herald. "(Cairo's) been on a tear. He had three hits (Thursday) and three the night before. He's capable." Cairo proved he was capable in his more than a decade as a pro. He made AAA, but he never made the majors. 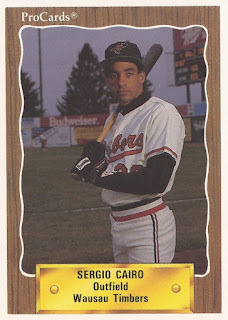 Cairo's career began in 1989, signed by the Orioles as a free agent out of his native Dominican Republic. Cairo started at rookie Bluefield. He hit .266 there over 57 games. He moved to single-A Wausau for 1990. then high-A Frederick in 1991. He first made AA in 1992 at Hagerstown. He hit .281 there, with two home runs and 45 RBI. He then moved on to other systems, playing 1993 between the Rangers and White Sox systems at high-A and AA. Cairo went 3 for 4 in a July game at high-A Port Charlotte with the Rangers, getting regular time there where he didn't get it at AA. "I would just like to have a chance," Cairo told The Sarasota Herald-Tribune after that game. "And I promise them here that when I put on my uniform I always do my best." He played 1994 at AA Tulsa with the Rangers, hitting .273 there, with a career high 14 home runs. He also made the Texas League team that took on a Mexican League team in an All-Star series. Cairo's final affiliated time came with a brief stint with the Expos at AA Harrisburg and AAA Ottawa in 1995. He then played the rest of the year in Mexico. Cairo arrived in independent ball in 1998 at Rio Grande Valley and Abilene. He continued in independent ball until 2002. He's recorded as playing his final pro time - his 14th pro season - in 2006 at Rio Grande Valley.